PerryGolf is delighted to welcome the delightful 8 passenger hotel barge Renaissance to our golf cruising portfolio. This 130 ft long vessel accommodates just eight guests in some of the finest and most spacious hotel barge accommodations available, and cruises along the canals of the beautiful and historic Burgundy region of France, slightly southwest of Paris. The area is renowned for its vineyards, Gothic churches, Renaissance châteaux and picturesque villages, with gastronomic ... Read More. delights and the art of living having reigned supreme here since Roman times. Renaissance has five members of crew who attend to the eight passengers throughout the cruise including a captain, tour guide, master chef and two housekeepers. The air conditioned interior includes a beautifully appointed lounge with comfortable seating, a cosy bar stocked with your favourites and bookshelves which contain a Bose CD system, current books, and up-to-date periodicals. She has four large suites which can be configured as twins or doubles. Each has a 60ft sq private bathroom and a TV/DVD system. The sundeck has seating and a spa pool, with bicycles also available for guests' use. Our special itinerary combines sightseeing plus three excellent golf courses, all within easy reach of your barging route, and each giving you the opportunity of experiencing the best of golf in Burgundy. Guests are met at a selected hotel in Paris in the early afternoon and transferred to the spacious Renaissance moored in Montargis, where a champagne welcome awaits you. An opportunity to settle into your new home, or to explore the pretty village of Montargis either on foot or bicycle. This morning, we cruise through the Loire countryside, with great towpath walking and cycling opportunities, to Montbuoy. After an early lunch, we transfer to Château Cely Golf Club, set in the grounds of a former private château this recently refurbished golf course has gained a reputation as one of the best courses in the Parisian region. NON-GOLFERS: This afternoon, we visit the splendid Château de Fontainebleau, a national museum and UNESCO World Heritage Site. To walk through this magnificent palace is to walk through the history of France and every French royal family added its own architectural style and features when in residence. This morning we visit Château de Sully-sur-Loire. The castle originally belonged to Georges de la Trémoïlle, who infuriated Joan of Arc by encouraging the Dauphin to devote himself to idle hunting in the forests around Sully. After Joan's failure to liberate Paris in 1430, de la Trémoïlle imprisoned her in the castle. In the 18th century Voltaire, exiled from Paris, also spent time at the château. Following lunch back on board, we enjoy an afternoon cruise to our mooring at the pretty and historic village of Rogny-les-Sept-Ecluses, with its 350-year-old 7 lock-flight, built during the reign of Henry IV of France and well worth visiting on foot. This morning, we enjoy an afternoon cruise to La Gazonne a beautiful mooring surrounded by lakes and ponds that provide water for the workings of the Canal de Briare. Following lunch golf is arranged at Roncemay Golf & Country Club. This international standard course, designed by Jean Garaialde in 1991 has hosted many of France's famous competitions. It is overlooked by the Chateau in whose grounds the course has been developed. NON-GOLFERS: This afternoon, our excursion is to the medieval town of Auxerre. Originally the capital of Lower Burgundy, the town prides itself on its lavish Renaissance houses, fine churches and particularly its magnificent Cathedral St Etienne situated close to the river. enjoy a visit to Auxerre. Plenty of time to walk through the steep narrow cobbled streets and enjoy some shopping. This evening dinner is ashore at Auberge des Templiers in Les Bezards. This Michelin-starred restaurant serves gourmet cuisine where traditional dishes are given a modern twist. Overnight: Renaissance at La Gazonne. This morning we cruise from La Gazonne to the little town of Briare, again with excellent walking and bicycling opportunities along the way. We preview Friday's crossing of Gustav Eiffel's magical Pont Canal, a 10,000 ton, 662 metre aqueduct over the River Loire that was completed in 1896. Following lunch, we visit a renowned, family-run winery in the hilltop village of Sancerre for a tour and private tasting. This medieval hilltop village overlooks a vibrant region which has known viticulture since Roman times. This morning, we take a morning visit to the local Friday market in Briare and wander round the many stalls of fruit, vegetable, seafood, cheese and fashion. Then, there is a short cruise across the aqueduct to reach the final mooring at Chatillon-sur-Loire. After an earlier lunch, we drive west to play Les Aisses. The course occupies a splendidly natural setting of heathland and forest and was remodelled by Martin Hawtree to great acclaim. It has many similarities with the great heathland courses in England. NON-GOLFERS: This afternoon, there is time for a visit to Gien, home of the Faience pottery, renowned for its beautifully decorated and vibrant dinnerware, or perhaps to explore the towpath on foot or bicycle. Upon the golfers' return, this evening enjoy the Captain's Farewell Dinner onboard. 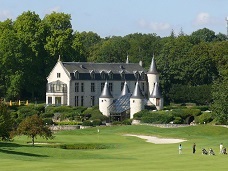 Château Cely Golf Club, set in the grounds of a former private château this recently refurbished golf course has gained a reputation as one of the best courses in the Parisian region. Roncemay Golf & Country Club. This international standard course, designed by Jean Garaialde in 1991 has hosted many of France's famous competitions. It is overlooked by the Chateau in whose grounds the course has been developed. Les Aisses. The course occupies a splendidly natural setting of heathland and forest and was remodelled by Martin Hawtree to great acclaim. It has many similarities with the great heathland courses in England. Minicoach transportation throughout, to all planned golf and sightseeing activities. Transfers to/from Renaissance on arrival/ departure at defined times from defined points. Set in the grounds of a former private château this recently refurbished golf course has gained a reputation as one of the best courses in the Parisian region. The course occupies a splendidly natural setting of heathland and forest and was remodelled by Martin Hawtree to great acclaim. It has many similarities with the great heathland courses in England.